These services all currently only accept Fiat currencies as payment, that is where DRIVR is completely different by creating a platform that not only accepts Fiat currency , but also it’s own DRIVR tokens and coins. The DRIVR app will allow the DRIVR’s full control over the charging rates to customers. This creates a completely different ecosystem for the Ridesharing model and we intend to make it a better opportunity for DRIVR’s to earn more money. In the words of some of the Uber drivers we have interviewed, we have found that Uber isn’t taking responsibility for any general service taxes in Countries such as Australia , yet they haven’t changed their percentage share. In Australia for example, the price Uber pays a driver per kilometre in most cases doesn’t even pay for the acceptable depreciation for a motor vehicle set out by the Australian Government. What does that tell us? Uber is taking more than their fair share. Over 54% of the market in Australia alone use ride sharing, which has now overtaken Taxi riders. At DRIVR, we are creating a real community of DRIVR’s that control the network from the road up. We will implement and appoint City Managers for every zone of our network and they too will share in the available revenue created. Is DRIVR the Uber and Lyft killer? To take over the already successful key market players, is obviously a little ambitious, however, with our focus on innovation and by creating better features we will not only be taking care of the customers better , they will receive cheaper rates and we will be looking after the DRIVR’s more to aid them to take better care of their families. We will chip away at the market with laser focus and receive our own market share without a doubt. You will read about some of the amazing points of difference that the DRIVR application on iOS and Android will feature, here is a snapshot of some of these: 1. Driver can modify the tariff 2. DRIVR takes a minimal 5-7% and only after the DRIVR has been driving with us for over 1 week *we call this the head start* 3. Customer will receive cheaper fares than the competition as a result 4. 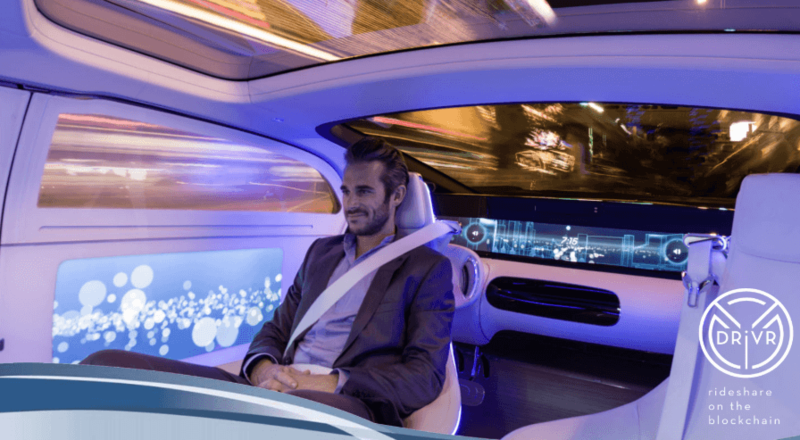 DRIVR will be investing heavily in autonomous self driving DRIVR’s for the future. How will DRIVR succeed in the market? Our primary focus is to be A.I. driven. Our frame work is designed to provide intelligence via Machine Learning. Camera-based vision systems and Cloud Intelligence. The Hail and Rideshare industry is worth over 200 billion annually worldwide. DRIVR Network will launch itself in key areas to gain some market share. The DRIVR application features an integrated Fiat and DVR Token Wallet. We will also be adding some exciting features such as crypto exchangers shortly after the 1st release. The DRIVR application is Autonomous Car ready on launch. DRIVR has a development team dedicated to keeping up with vehicle autonomy, in fact our application is driverless car ready. The DRIVR Network application will be moved into a Decentralised App (Dapp) in a future release, please refer to roadmap for more information on release dates. Most Ride share applications are clones that follow the market leaders. We redefine the user experience by empowering users and drivers with better options. The DRIVR applications will be available not long after the ICO on Google PlayStore and iOS Appstore. It will feature many points of difference from key market players. DRIVR will change the way drivers and riders interact, by allowing drivers to set rates, maintain riders in their favourites and allow more control for the driver and the passengers. DVR Token Private Pre-sale begins. DVR Token Pre ICO launch. DVR Token Main ICO begins. Exchange Listings commence.On selected exchanges. DVR Token Listed on CoinMarketCap.Listing all collateral on CoinMarketCap. DRIVR Application Release on iOS & Android.On selected exchanges. Soft launch in 10 Cities worldwide.Cities to be released shortly. Standalone Desktop Wallet Release.DVR Windows Wallet, DVR Linux Desktop Wallet, DVR Mac Desktop Wallet. Standalone iOS & Android Wallet Release.DVR Standalone Android App – Wallet & DVR Android App – Wallet. Free ride stimulation campaign.DVR Community Drive – Free Ride Promotion. Register for Technology Events.Register for Technology Events Worldwide. DRIVR Reward & Debit Card.DRIVR Rewards and Debit Card Launch. A.I. research and Autonomous Announcement.Announcement on DRIVR Network – A.I. research and Autonomous technology teams. Launch in 10 more Cities - Worldwide. Showcase Achievements - Media Release.Showcasing DRIVR Network development results. More cities added to the DRIVR network.Adding more cities to the DRIVR network. DRIVR Network Insurance.DRIVR Network Insurance launch. Announcement Strategic Partnership.Integration of new partnerships / DRIVR expansion. Release of Dapp.Testing of Decentralised Apps (Dapp).